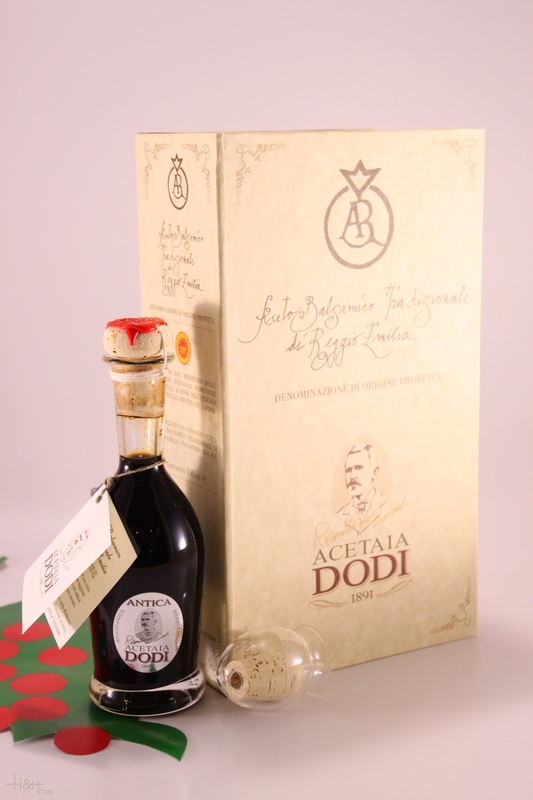 Balm vinegar Balsamico Traditionally Argento Dodi Acetaia 100 ml. After at least 20 years of pouring and ageing you take the first barrel the amount in traditional balm vinegar Reggio Emilia whom you think to use during the year. A part of it is subordinated to the judgment of the taste examiners, for the classification in three different "seals". The division of the traditional balm vinegar Reggio Emilia in "bollino Aragosta" (crawfish seal), "bollino Argento" (silver seal) and "bollino Oro" (golden seal) takes place according to the strictest criteria which are determined in the production order. Taste examiners conduct the samples and give to every vinegar a point number, according to his visual, olfactory and flavorful signs. The ageing time of the Balsamico with silver seal must be at least 20 years. Buy now this product together with Balm vinegar Balsamico Traditionally Oro Dodi Acetaia 100 ml. Balm vinegar Balsamico Traditionally Oro Dodi Acetaia 100 ml. ready for shipment: in stock Balm vinegar Balsamico Traditionally Oro Dodi Acetaia 100 ml. Balm vinegar Balsamico Il Buon Condimento Matisse Dodi Acetaia 250 ml. Balm vinegar Balsamico Riserva di Famiglia Anselmo Dodi Acetaia 100 ml.